Dr. Newland was born July 19, 1821, in Jackson County, Indiana. He died April 5, 1889, in Bedford, Indiana. 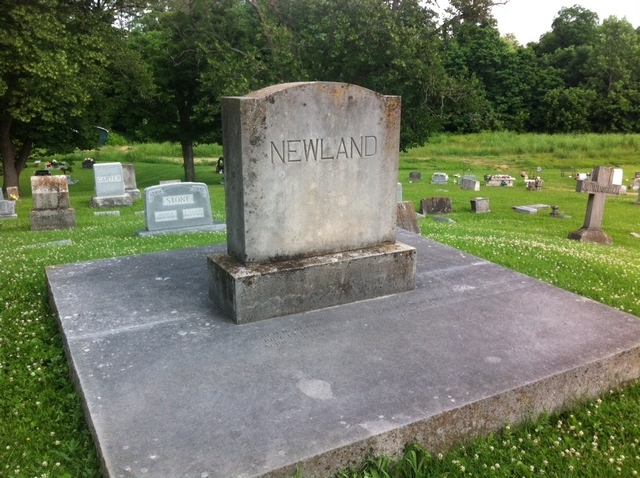 Not counting those buried in the Old Section (the Bedford Graveyard) before 1889, Benjamin Newland was the first person to be buried in the "new" expanded Green Hill Cemetery after it's official incorporation. Benjamin Newland was educated largely from public schools, partly from home instruction, supplemented by reading under his own guidance. Benjamin graduated from the medical department of the University of Louisville, Kentucky in 1847. Dr. Elijah Newland, of Salem, Indiana, was his preceptor in medicine. Dr. Benjamin Newland began his professional career in Bedford and continued there until his death, except the year he was in military service during the Civil War. He was a man of mark and distinction in all the relations of life; as a general practitioner with a love and tendency to surgery; as a surgeon in the army; as a politician and State Senator; as a business man and banker; as a Mason of the Knight Templar degree; and as a member of the Christian Church. He was a member of County, State, and National Medical Societies and of several district and railroad medical organizations. Newland married Louisa A. Curry, Dec. 28, 1846. They were survived by four daughters. His funeral was a "noted event" in Lawrence County for years.